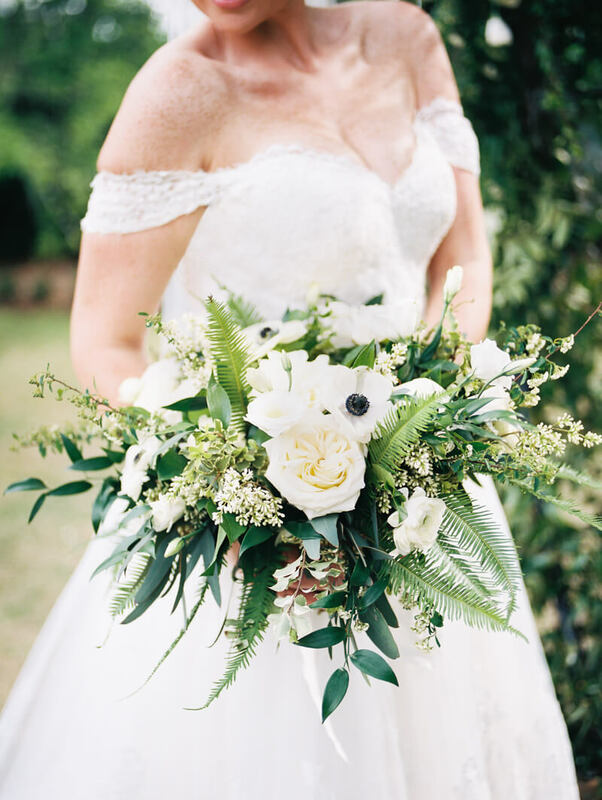 It’s no surprise Ashley and Charles celebrated their marriage with a timeless, quintessentially Southern wedding at Wrightsville Manor in Wilmington, NC. They both hale from the Tarheel State. They met and fell in love as students at the University of North Carolina at Wilmington more than six years ago. And while their hearts never linger too far from the ocean, something about this charming coastal town always draws them back. 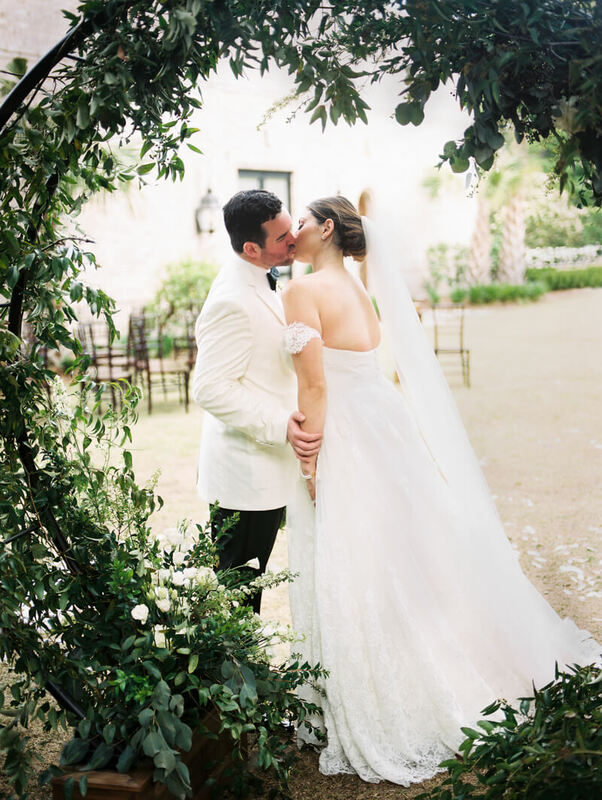 Letting elegance lead the way, Charles wore a white tuxedo jacket with black pants and a black bow tie, while Ashley chose a stunning off-the-shoulder lace gown with a chapel-length veil. 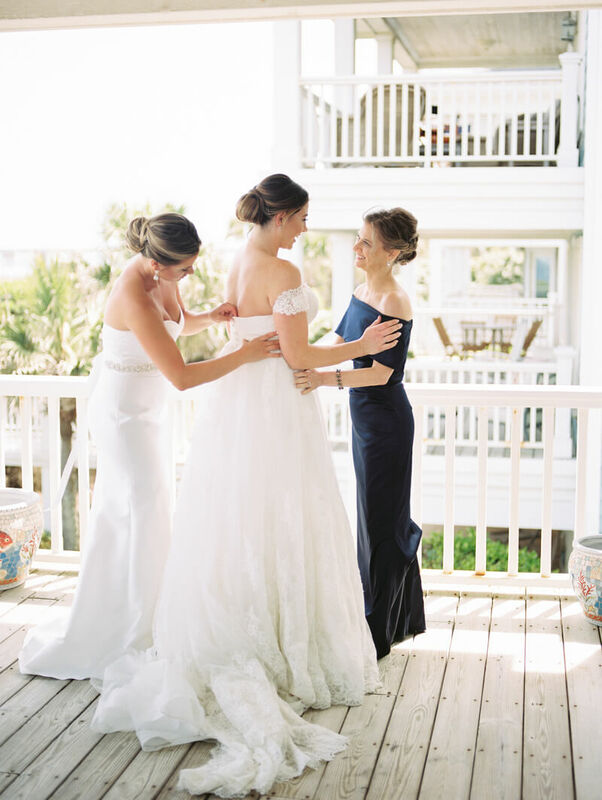 Bucking tradition, the bride even chose white trumpet-style bridesmaid dresses because the color and style was perfect. 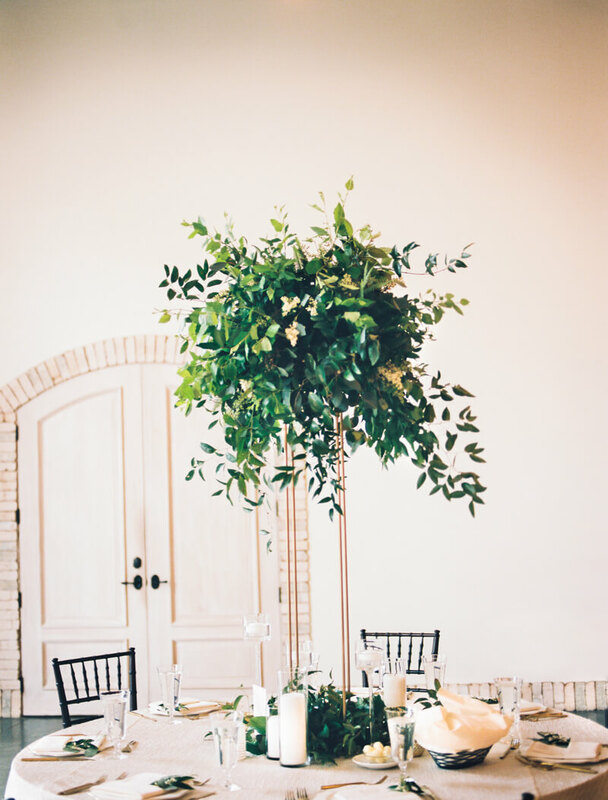 Keepsake Memories Photography was on hand to document their special day designed with ample greenery, neutral colors and touches of gold. 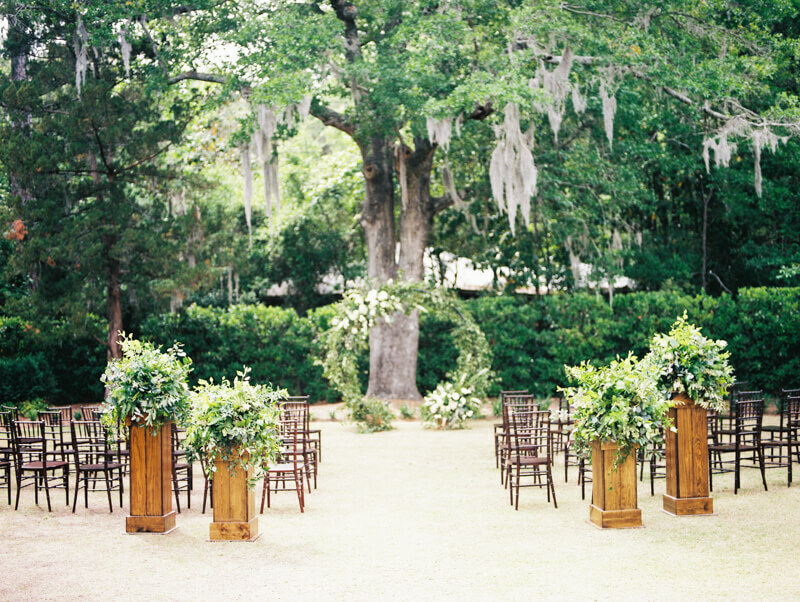 An outdoor ceremony on the lush garden lawn was followed by a reception teeming with both charm and sophistication inside the manor’s historic brick building. 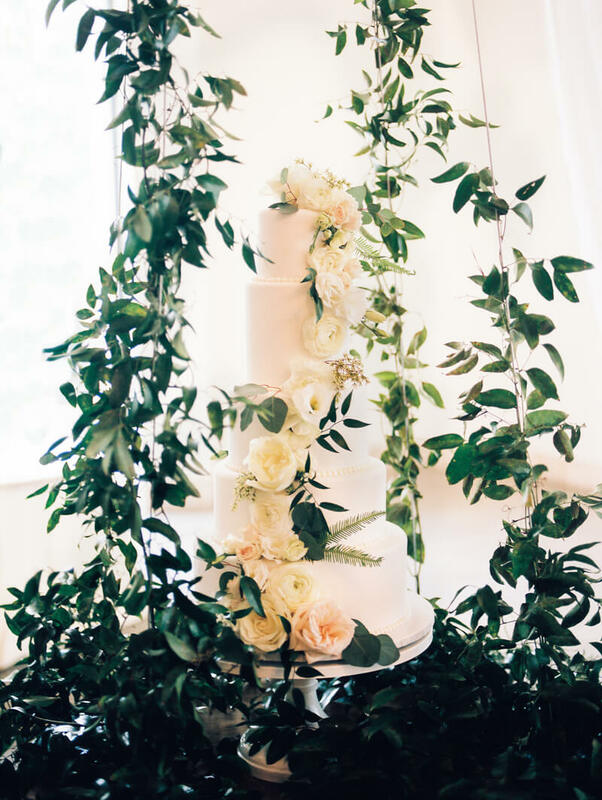 Their classic, yet fun affair included a custom monogram, a suspended wedding cake, and a true Southern staple, shrimp and grits. The Cover of our Fall/Summer 2018 issue. From the bride: My advice for couples is to still take time to be a 'couple' during their planning process. Take that extra day on a weekend and go to a quick trip on the coast and get away from all the planning. Join a gym together to get "wedding ready" if that is your goal so that you can see each other and motivate one another there. There will ALWAYS be hiccups in the planning process that you do not expect, and a ton more work goes into your wedding day than you can ever imagine, so ensuring you still take the time to be yourselves aside from just being a 'bride' and 'groom' is my number one advice. It really helps you to enjoy the process more!! The only other critical piece of advice is to plan ahead. Even with an 18 month engagement, so many things truly only get done in those last few months and weeks leading to the big day. Plan to have extra time in your schedule, and know that you may just need some extra wine during that time too! Take a step back, and appreciate the big picture that you and your significant other are getting married! If you trust your vendors who you have so carefully chosen, the day turns out perfectly. Bride’s Veil: This was my mother-in-law's veil from her wedding day that I had redone for my wedding, and was my "something old".